A very interesting steel vegetable or herb chopper from the latter part of the 19th century. This chopper is quite an unusual shape but it also has a very interesting mark. 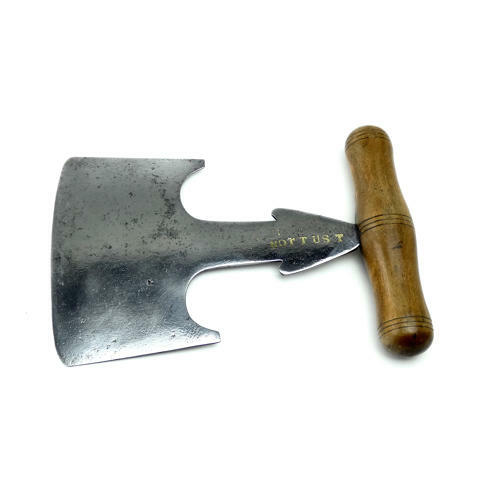 The word 'NOTTUST' is inlaid, in brass, into the steel near the handle. This is not a manufacturers mark, as I can find no reference to any company with this name. It is probably the name of the original owner and it could have been made for them as a one off by a local blacksmith. The handle is turned from oak and the steel blade has been hand forged. There is very minor pitting to the steel, as you would expect from use, but the piece is in very good condition.